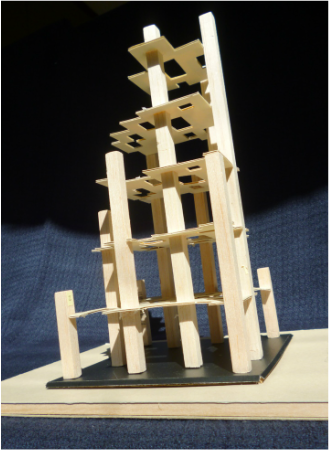 Model of A Vertical City. Courtesy: Kenneth King. ​The course of inquiry that resulted in this book led us to speculate about the physical form that high-rise sustainable living might optimally assume. Having asked the questions, we wanted to explore the answers and to see whether such a solution might actually be possible in the form of a super tall vertical city. Several approaches appear in the book in a step-by-step rational progression, each conclusion growing naturally from those that came before and leading collectively, and we believe inevitably, to our design proposal. We began by considering elemental human needs and residential patterns and proceeded onward, and upward, from there.